Reds, tell us about a quirk of your writing and how you get past the problem, if you know how it happens. HANK PHILLIPPI RYAN: Working working working working..I missed my 32,000 words (cumulative total for last week) goal yesterday by 50 words. Dumb, but at that point I couldn't even think of 50 bad words, let alone good ones. The 1000 words a day goal is really successful--because it's a doable thing. BUT. I'm still telling myself I only have to do 540 words a day, and when I reach that, I push myself to 1000. It's seems to work for me to have a two-tiered goal. So the first one is definitely doable. And I feel so virtuous. Then I press on if I can. If I fail to get 1000, I haven't failed--because I made the first goal! So ridiculous how I have to trick myself. EVERY day. And it really helps to look at the manuscript every day. Even on a day when for some reason I can't write, I still--as I explain to Jonathan--have to say goodnight to the book. Wallace Stegner has a great quote: "You have to at least give the muse a CHANCE to visit." I think of that all the time. yourself. I can be rigid about word count, and then find myself frustrated even if I did make some progress. Your two-tiered goal sounds like a great way to make progress and feel good about that progress, even if you don't hit the ideal every day. Like Hallie, I have some of my best ideas in the murky space between being asleep and being awake. I always have pen and paper by the bed to catch those ideas, which hopefully, make some sense when I’m fully conscious! And NaNoWriMo? Nope. Never. That sort of deadline adds unnecessary stress to the process, but my hats off to anyone who participates! HANK: Yeah, Ingrid. Might as well succeed! JULIA SPENCER-FLEMING: Excellent advice, Hank. I was supposed to be doing the NaNoWriMo and got about three days in when I realized I wasn't ready to pick my ms up where I left off. I've been rereading and editing what I have to get back into the story. When I caught myself thinking it would be easier to simply start a whole new book, I realized I needed to do something different. So I'm trying a writing hack from the fabulous Jennifer Crusie: I'm going to start writing scenes I already have in mind from later in the story and worry about stitching them together later. HALLIE EPHRON: I was supposed to be doing NaNoWriMo, too, and got about one day in and realized I just can't write fast. Nope. Uh uh. No can do. I *need* to second-guess myself and go back and change, because my first impulse is rarely my best. And often my best impulse then requires that I go back and insert (or delete) to establish the foundation for whatever I wrote. I call it "iterative" but it could also be called chaotic. I get my best ideas falling asleep and waking up in the morning. And if I have an idea, it'll fuel me through the next day. So I keep a piece of paper and pencil by the bed and try to write legibly. HANK: Oh, I change everything dozens and dozens and dozens of times. Just because you type it doesn't mean you have to keep it. But I find that just writing something is better than writing nothing. Then I'll think--what if it were this way? What if it were that way? Do I have enough setting here? What's the reason for this? And often just having my brain feeling like it's editing rather than writing gives me ideas. But I think the point of NaNoWriMo is NOT speed. Not speed at all. It's forward motion. JENN McKINLAY: Lucy, the middle is the worst. It's where I stumble on every single book. I have no idea why but the relief when I realize I have pulled out of the middle and am cruising toward the end is like an endorphin rush for me. I don't really have any quirks, at least I don't think so. I'm just a plow horse, happy to be in the field, watching the butterflies while I put my shoulder into it and haul the rig. Sometimes the the writing is effortless and other times it's a strain, but I know if I just keep putting one word after another, the story will come. RHYS BOWEN: Hank, my mantra is always NOTHING IS WRITTEN IN STONE. I try to be objective enough to let go of a scene that I love because it slows the action or simply doesn't move the story in the direction I want it. For me the first fifty pages are always agony. I start a new book knowing nothing, or almost nothing. I begin with, "Wouldn't it be fun if Georgie has to gate crash an important conference in Italy with Nazis?" and then I send her there and hope that good things will happen. So the first chapters are like always fraught with angst. What if this story doesn't work? What if it's not as good as the other books? Then I see a glimmer of light and by page 100 I know where I am going and then it gallops along to the end. I aim for 1500 words a day. That way I know I can finish a first draft within three months. But I make myself write those 1500 words even if I feel totally dry and I think they are the worst 1500 words ever written. Usually when I examine them the next day they are not as bad as I thought and I can polish them and forge ahead. LUCY: Oh I am right there Rhys, in the "what if this isn't as good as the others?" stage. It IS agony! I was an absolute failure at our Mini Nano, and it was my idea! I got off to a decent start, but then I got the flu, and then it was Thanksgiving, etc., etc., etc. But the biggest problem (other than my lack of discipline) is that I just don't write fast in the first half of a book. The closer I get to the end, the more words in a day. But I'll be back at Mini Nano word goals the 1st of January!!!! I usually drink tea while I write, like Julia. But, Julia, how on earth do you write in bed without your back killing you? I must have my Aeron chair! HANK: But it's math, you know? Addition addition addition. If you just keep doing it, it will get done. And then you can fix it. HALLIE: Aeron chair? Going to look it up right now. If you rub it does the magic writing genie appear? RED READERS: Writing tips or quirks or questions? Gee, all I can say is I’m certainly glad all of you keep writing in spite of all the struggles and frustrations [thank you for doing that] because the end result is always a wonderful book for all of us readers to enjoy . . . .
My thoughts exactly, Joan. So grateful for the work you all do and the care you put into your masterpiece. Artists, each and every one. Thanks so much Joan and Hillary--we always feel glad at the end too:), it's just not a very pretty path getting there! My first traditionally published book was a Nano product. I remember getting up at 2 AM to get those last 5k (yes 5k) into the WIP on November 30. They made it. The end result, after a full year of editing, looked nothing like the November 30 Nano book, but those 50,000 words did form the basis for that first book. Never managed to do another Nano, but like the Reds, I have done mini-Nanos with friends to get words on the page. My process is write first thing in the morning (after checking in on favorite blogs). Read and edit those words in the evening. In the morning, a quick skim for content and to get flow for the next 1,000 before going to the day job. Way to slow for Nano. Hank, love the two tier word goal. It's perfect! Mind if I poach? I cannot even picture 5000 words in a morning Kait! Hank and all of us would be happy to have you poach whatever seems the slightest bit helpful! Of course ! You can make it on motto: might as well succeed! I'm going to poach, too! And I have done 5000 words a day--but only at the end of a book. It has been really fascinating to read all your responses to your writing goals and challenges, Reds. You seem to know what works for you, and where you get stuck, so just keep doing what you do!! I don't think you need the added pressure of participating in NaNoWriMo. I like Hank's two-tier goal that goes up! That works for many goals, not just writing...to strive higher if you make the first tier. LOL Grace. I would fear that if I used the two-tier system, I'd always quit at the first stop! You won’t — that’s part of it the secret! Funny, Grace, I also thought how that two-tier goal thing isn't specific to writing. Since I started using a Fitbit tracker, I am that way about my step goals. The official goal at which it compliments me is 10,000, but my real, personal goal is at least 11,000. But if I got the "atta girl" from my tracker, I still never feel like a failure. It's always SO gratifying to hear other, more experienced writers like some of you Reds say you have those anxieties about if the book is any good. I get them too, but now I just tell them to shut up and go away, because I know I'll finish and then I'll fix. I set a 1500 words/day goal, and sometimes exceed it, especially when I go on solo retreat and can do 5000 or more in a day (unlike at home, on retreat I write morning, afternoon, and evening). I can now write a first draft in under two months. One trick when I'm sitting staring at the blank screen is to type, "Start typing, idiot!" 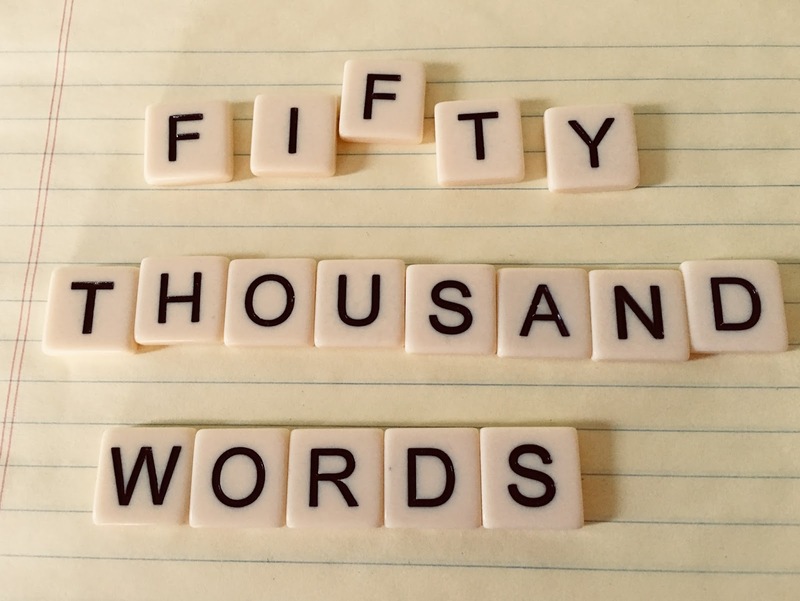 Another mantra, for when I'm short a few hundred words, is, "Anyone can write 300 words." Like the mantra I had for my sons when I presented them with a new food: "Anyone can take three bites of anything." That's basically what my husband used to teach, Edith, only his goal was 250 words. He used to swear you could fit 250 words on a 3 x 5 note card, and anyone could crank out that much in a day. Clearly you go above and beyond! I still go by Warren's maxim. If I sit down at the computer I can at least do 250 words. Which usually turns into more. I don't do word count goals. I aim for a scene a day. Curiously, that usually does come out at around 1000-1500 words. Not necessarily good words, but once there's something there, it can be fixed. I'm mid book now and it's hair pulling time. I set up all kinds of things in the early chapters. Now I have to DO something with them or throw them out. Aargh! Just once I'd love to know where the story is going ahead of time. Why is it so reassuring to hear that other writers struggle just as hard? Misery loves company LOL. I like your idea of judging according to scenes rather than words! As to "struggles with the middle", my reading pattern is like that. Reading the first several chapters at a good pace, resisting putting the book mark in until at least the end of the chapter. Middle: no problem putting that book mark in at any point. End: "oh, my, it's one a.m., but there are only 20/75/100 pages to go!" This is probably why I almost always start a reread within in a week of the first! Thank you for all the wonderful words in your books and here at Jungle Reds. so interesting that your reading has a pattern similar to our writing! Do you think the story is less interesting in the middle?? Lucy, the story is still interesting in the middle. The middle is like visiting a familiar place and looking around to see what happened since I was last there. The "urgency" of meeting everyone and checking out the place (the early chapters) and of "what IS going to happen to end this well" (the ending chapters) just is not there in middle. But the middle is a wonderful place. I write skinny first drafts that go fast (plot and dialogue), and then anguish over deep POV, dramatic tension, and all the other goodies that make a good read. Debs has been trying to temp me back into writing fiction, as opposed to all the program notes, liner notes, video scripts and grant proposals I write at work, but I utterly failed her when it came to NaNoWriMo. I was supposed to write something. She was supposed to write something. Then, in an attempt to re-create our old critique group's pattern of turning something new in every two weeks, we would swap somethings. I completely blew it. No new words from me this month, although she tells me she's somewhere into a new chapter. Which she won't let me read, because I haven't turned in any pages to her. Arrgh! Doesn’t have to be perfect! It doesn’t, really, even have to be good! 250 words! Perfect. Gigi, let's shoot for the weekend after Christmas. We can both get something done by then! Go for it Gigi, don't waste the chance to read Deb's book way before the rest of us!! There went our mental picture of you lounging in bed, sipping tea, petting the dog, and madly writing when the spirit moves you! Thanks so much for these insights into your writing processes. I guess it's good to hear that after a good number of wonderful books you still have these worries about the next one, because it means it will be wonderful too. I'm so grateful that you take the time to share this stuff, and also for everyone's comments. As I'm getting started with writing, I find myself wanting to go back and fix things when I might not even know what's coming next. I also find myself writing almost all dialog; I wonder what that suggests. I need to recapture (maybe not fully) the approach that I had when I did NaNoWriMo three years ago: I followed Annie Lamott's advice to write a truly sh*tty first draft. And boy, did I. Anything at all that occurred to me, I just took off with it and wrote a bad scene. Who knew what might eventually be able to be turned into something good? I suspect several dozens of words from that 50K+ will make it into subsequent drafts. I was able to cruise through that process, while working a full-time job, because I had been thinking about the story and the characters for a while, so I wasn't starting from scratch. Also, Edna was so encouraging, and so cheerful about being a NaNoWidow, that it gave me a lift when I struggled. My daily goal when I'm writing the first draft is 1,000 words/day. I can ususally hit that. I'm actually secretly hoping for 1,500 or more, but if I hit 1,000, I feel I've worked. Editing and revision is less about word count and more about polishing at least one chapter. After many tries, I found I do not do rigid outlines well, but neither can I critique/revise until that sloppy first draft (Draft Zero, as I call it) is done. That is necessary for me to know the bones of the story. A critique partner says that IS my outline. It takes me anywhere from four to six weeks to finish that draft and it often is radically different from what is in my head, because the ideas morph as I write. After that, revision where things can and do change again. I like the idea of a "draft zero." Somehow that seems less daunting than a first draft! The concept was very freeing for me. No one will see Draft Zero except me, so I can put whatever crazy idea comes to me on the page and fix it later. I write just like you, Jim... Fits and starts. And I Do go back and fix as I write because it feels like making corrections to the course of an ocean liner... if I don't get it going in the right direction, it will veer WAY of course by the end. And if all that comes to you at first is dialogue, write it and then go back in and add internal dialogue, actions, setting... the dialogue is an anchor. And I am happy to report I got up early this morning and have already written my daily quota which is only 500 words and I have more to go. I'm past the 2/3 mark, so I'm starting to see where this is going. I love getting past the 2/3 mark! I am totally in awe of you writers. However you get the words on paper. Or screen. I find writing a real chore. I hate to even think about having to write something. My joy is reading. we are so grateful to have you in our tribe Pat! we love readers! I can't imagine a writer who steadily pounds out a manuscript, patting him/herself on the back as they go about how brilliant it all is. I feel for your struggles, Reds, but it makes you the great writers who hook us in and bring us back, begging for more--book after book. I have actually been doing what Julia said--there is a story I want to tell and I couldn't seem to make any progress on it, so I began to just write scenes--and like Hallie said, I do edit as I go--but I also see where I can go back later and layer in more on these bare bones. Thanks for sharing! Re notes from bed- When I was young I was on a swim team. One night as I was half asleep, I realized the perfect way to win more races. I grabbed my paper and pen and wrote it down and went to sleep very pleased with myself. In the morning I eagerly grabbed the paper and read (amazingly, it was legible), "Swim faster." that is too funny Libby! I know in my heart how hard you work to bring your books to publication, how painful it must be to wait for the reviews, how much you take a less than good review to heart. And I know that most of us readers could no more do what you do than paint the ceiling of the Sistine Chapel. I hope each of you are rewarded with a best seller this year, one that gets starred reviews on Kirkus, makes the NYT Book review in some fashion. And even if this book isn't the "one," remember there is next year. You are welcome and we do feel appreciated by you Ann--thanks so much for that. Love your wish for the new year too! Thank you, Ann! We hope you know how much we appreciate you! I met author Barb Ross at a Sisters in Crime workshop maybe ten years ago. Her first book came out a while later, while I was struggling to finish writing my first one. I read Death of an Ambitious Woman in a day, and then felt terrible! I knew it had taken her a year or more to write - and I ate it in one serving. Ann, I know that guilt, but mine is not from multi-tasking. Forgive Jungle Red Writers, but I am a Louise Penny fan girl. She chronicles her writing progress on her Facebook page, in great detail. It is clear that writing is hard work It takes a year of that hard work to produce each new Three Pines mystery novel. I get the new book in the mail -- 48 hours and done! Surely skipping over many of her careful words. Hard working writers, guilty readers. A magical, awesome mix. I'll try to be more appreciative of your works from now on. Whew! Although I never did think it was easy. All I can offer is encouragement and gratitude; I would hate to add more pressure to anyone! we love receiving your encouragement and gratitude, thank you! Hallie, there are lots of ergonomic chairs out there but Herman Miller's award-winning Aeron Chair is iconic now. They are expensive but worth every penny, and you can often find them used when companies close or redecorate. We have four of them (bought at different times) but all are at least fifteen years old and still great. Debs, were you able to find one built for short people? Most of those chairs have a back that's too high for me, and all the supports hit me in the wrong places. Edith, I'm a couple of inches taller than you, I think, but the Aeron adjust low enough that my feet are comfortably flat on the floor. The lumbar support adjusts, too, or you can take it off if you don't like it. It does take some getting used to the first few days, but I find it makes a huge difference. My husband swears by his Aeron chair. He's had his for more than a decade, and it's gotten a ton of use, but is still in good shape. I agree with Debs that they're worth every penny. I enjoyed today's post and I've really enjoyed all the comments. But what really caught my ear as I read the post was Jenn's comment, "I'm just a plow horse...I put my shoulder into it and haul the rig." I've read several of Jenn's books this year, and I have to say that the finished products sound NOTHING like that! It just really caught my attention to think that such a workmanlike approach could produce the light, breezy, easy-flowing stories I'm enjoying! I guess I'll just end by adding my thanks to all of you for staying the course and turning out those books we love so much. Without a doubt, you Reds make our world a better place! Several years ago I tried to participate in National Writing Month and I could not eke out 1,000 words in one month. I was lucky if I could write 50 words in one week! I am great with ideas though I have to say I struggle with writing. Trying to figure out why it's difficult when it's easy for me to reply to emails and letters. Need to remember the How, Where, Which, Why, and Who in putting together a story. I remember when I was a kid, writing stories when I was 10 years old that it seemed so easy for me to write a story in class. My teacher asked me questions. In college, one of my professors advised me to write every day. Perhaps I need to try writing in a journal daily to practice my writing for myself? Deborah, thank you. I think I have a copy of the Writing Down the Bones book by Natalie Goldberg. I'll take a gander at the book and try writing again. Thanks! Hank, I love your minimum easy goal . . . and then proceed at will. The only summer I taught summer school, I put up a list of point accumulations for passing, to give students tangible targets. One young man hit the passing mark with a week to go. "I could stop now and still pass?" "Yes, or you could keep going and aim for a C."
"I've never had a C."
"You could do it." . . . and he did. I used to set early deadlines for papers, to reduce stress. Thanks, all, for persisting for our reading pleasure. I enjoyed the Mini NaNoWriMo! I think I need to keep it up. No matter how I prepare, deadlines always seem to jump out at me from the shadows when I least expect them even though I know they're there. Aaaaaah!